Cal Poly Pomona President Michael Ortiz receives a proclamation commending him for his lengthy career of outstanding service in higher education. 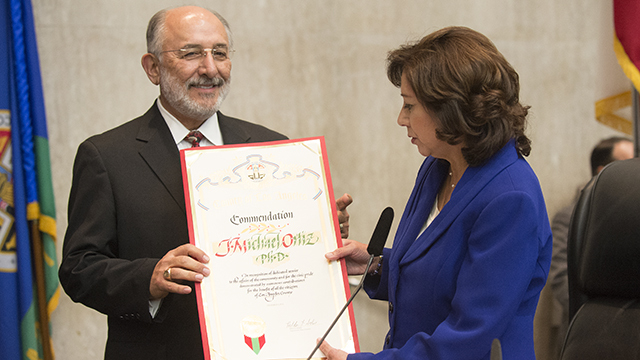 Los Angeles County Supervisor Hilda Solis, an alumna and former scholar-in-residence, presented Ortiz with the proclamation. President Michael Ortiz has been commended for his service to higher education, the Cal State University system and Cal Poly Pomona. On Tuesday, the Los Angeles County Board of Supervisors recognized him with a proclamation for his 42 years of dedicated and outstanding service to education. Supervisor Hilda Solis, a Cal Poly Pomona alumna and former Scholar-in-Residence, presented the commendation. On Nov. 13, the CSU Board of Trustees bestowed Ortiz with the title of President Emeritus. The trustees lauded his emphasis on CSU and university efforts to expand student success programs, increase graduation rates and champion access for underrepresented student groups. The College of Education & Integrative Studies also conferred him with the title of Professor Emeritus at the Academic Senate meeting on Nov. 19. Ortiz, a well-known expert in early childhood education, supported Partners in Education and championed the college’s doctoral program in educational leadership. During Ortiz’s presidency, the university was designated as a Hispanic-serving institution and authorized to offer a Spanish single-subject credential program.